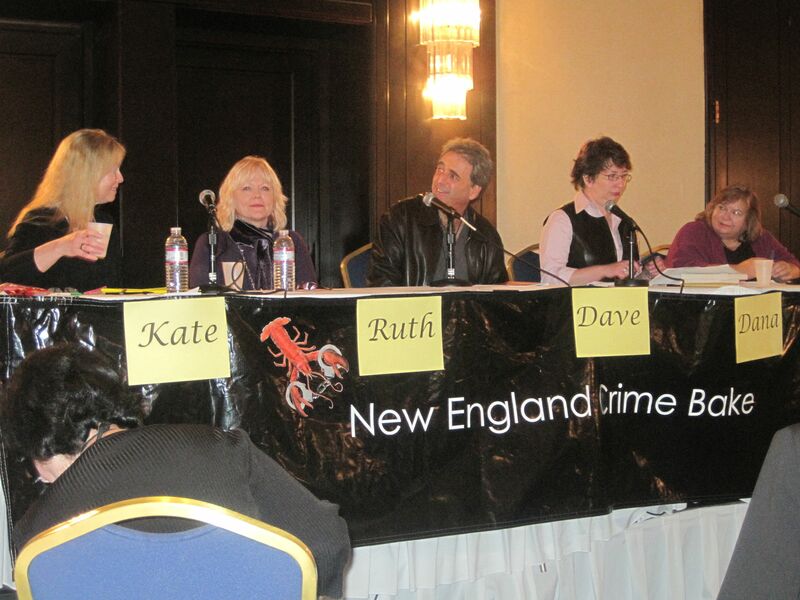 Last weekend, I had the pleasure of attending the eighth edition of the New England Crime Bake. (In fact, it was my eighth visit–I haven’t missed one yet!) Crime Bake is aimed at mystery writers–both aspiring and previously published–but it’s great for any mystery fan. A hotel filled with writers and readers of mysteries–what’s not to like? This year’s Guest of Honor was Sue Grafton, and she was a darned good one, whether talking about her path to becoming the bestselling author she is today (along with other bestselling authors Joseph Finder, Lisa Gardner, and Michael Palmer), or warning about mistakes not to make in your writing. My own panel was “P is for Persistence,” in which moderator Kate Flora, Ruth McCarty, Dave Zeltserman, Dana Cameron, and I talked about strategies for keeping ourselves going despite rejections, dropped series, and bad reviews. Ruth calls rejections returns; I call them motive for murder. There were plenty of other panels to learn from over the course of the weekend, but I admit what I like best is socializing and gossiping and talking shop with agents, editors, and other writers. This meant spending a lot of time at the bar, but it was a sacrifice I was willing to make. I also critiqued two aspiring authors (and wouldn’t be at all surprised to see both of them published over the next few years), and chatted with a great group of people at the breakfast table I hosted. I only wish I could remember everybody’s names! We’ve done no sentence, but committed a crime. We’ve had blood splashed in our face, but we’ve come through. We did a murder, my friends. And we’ll keep on killing, ’til the end. See what you missed if you didn’t come to Crime Bake? But don’t despair. You’ll have another chance November 12 though 14, 2010, when the Guest of Honor will be the effervescent Charlaine Harris. Mark your calendar now–this year’s Crime Bake was sold out, and I wouldn’t be surprised if it doesn’t happen again. It’s that good a conference.